Cross Marine divers are also ADC members. 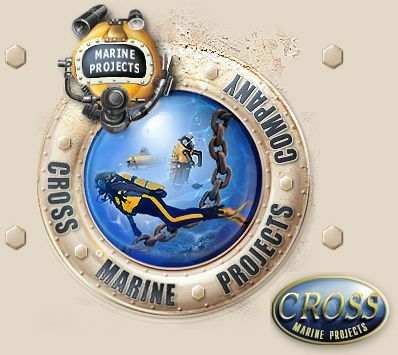 Cross Marine Projects is a full service Commercial Diving and Marine Construction company. We serve municipal water facilities, government agencies, and private companies by performing underwater inspections, underwater salvage, marine surveys, underwater pipelines, dredging, dam intake repairs, harbor construction and other marine related services. We offer innovative solutions to complex problems using the highest quality materials and latest commercial diving equipment. Our goal is to provide solutions that last in a timely and efficient manner. Our staff can assist you during the pre-planning, bidding and completion phases of your marine project. In addition to marine construction services, we also provide potable water tank inspections and cleaning services for regional municipalities. Our Water Tank Inspection Team is comprised of experienced commercial divers and water tank technicians. Using the latest in water tank inspection and cleaning equipment, our Team will provide you with a fast and safe inspection. To schedule a Water Tank Inspection or to learn more about our national Commercial Diving services, call Toll Free 866-763-1223. Also visit CMP Environmental to learn about our environmental survey and remediation services.